Sleep is so important we spend a third of our lives doing it - which is why your bedroom is arguably the most important room in the house. To fully relax, we need tranquil surroundings that suit our style, so picking the right bedroom furniture is an absolute must. With the help of our trusty guide, make sure you have everything you need for a sound slumber. Materials can make all the difference to the bedroom furniture you choose. 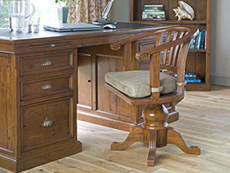 Solid wood bedroom furniture is a popular choice, with oak, pine and hardwoods being common options. Solid pine bedroom furniture provides great value for money and looks fantastic in a range of finishes. 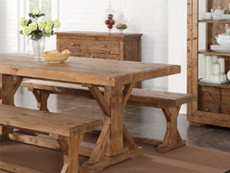 Pine is a light wood that's sturdy and excellent for staining. Solid oak bedroom furniture is strong and heavy with a beautiful woodgrain that comes through when finished in a clear lacquer. You can also purchase oak bedroom furniture that includes oak veneers. Veneers make furniture more durable and attractive. Bedroom furniture is also stronger and less likely to warp or split than solid wood. 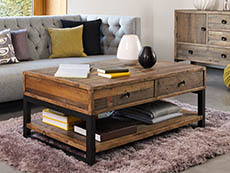 Alternatively, there's reclaimed wood, an eco-friendly option which also has plenty of longevity. Because the wood is older, it's done plenty of expanding and contracting over its lifetime and so won't be as prone to movement. This makes splitting and cracking less likely to occur. Reclaimed, painted, oak and pine bedroom furniture are all available in our collection. Bedroom clutter is the enemy of the sound sleeper and the early riser. Messy shelves and surfaces make us feel we've got unfinished business, while jumbled clothes can turn morning routines into a nightmare. That's why a well-chosen chest of drawers, bedside table and wardrobe can make all the difference. Together, these three items are often called bedroom set, and many of our ranges include all three items, so you can kit out the whole bedroom in a uniform style. Explore our oak, painted, pine and reclaimed bedroom sets to find the perfect fit for your room. Chests of drawers are useful for storing casual clothes, freeing up your wardrobe. This prevents clothes from creasing due to lack of space. Chests of drawers can be found in a variety of styles, including Wellington chests or tallboys, wide chests, 2 over 3s and 3 over 4s. It all depends on what you're storing and how much room you have available in your bedroom. Bedside tables are the ideal place for storing underwear and pyjamas. The top surface can be used for those useful bedside essentials, such as your phone, glasses or latest read. In addition, a bedside lamp can provide extra lighting. 2 and 3 drawer options are available. Clothes look so good in our fabulous wardrobes you'll be reluctant to take them off the hanger. Our single wardrobes are ideal for smaller bedrooms, while our roomier double and triple wardrobes house your smarts and casuals with ease. Why not throw in a blanket box for even more storage? Blanket boxes are useful for storing extra cushions and blankets, ready for visiting guests or those cold winter nights. They're also a good choice in children's rooms for keeping toys tidy. Dressing tables are the perfect kind of bedroom furniture for your styling needs - so why not pick one as stylish as you? For elegance or a contemporary style, explore our painted and reclaimed options. For the natural look, try pine or oak. Matching stools and swing mirrors are also available. Your mattress may not be the belle of the bedroom ball, but it's all that stands between you and a miserable night. Snoring partners, sore muscles, sleep deprivation and a foul temper can all be averted with the right purchase. Whether you're single or double, king or super king, choose between traditional pocket spring mattresses and form-fitting memory foam in a range of comfort options. Beds are the pièce de résistance of your bedroom. They give the room its purpose and are the starting point for choosing the rest of your bedroom furniture. Whether you favour luxurious fabric divan beds or sturdy wooden bedframes, we'll find the right look for you. Finally, top off your bed with one of our appealing headboards. Our selection of strutted and deep continental styles can be upholstered in a range of colours to suit your décor and the rest of your furniture. Go for sleek, plain headboards for a contemporary style or use buttons and piping for a splash of extravagance. For the best rest money can buy, look no further than Furniture Barn.